Reliability is one of the most important quality characteristics of components, products, and large and complex systems—but it takes a significant amount of time and resources to bring reliability to fruition. Thoroughly classroom- and industry-tested, this book helps ensure that engineers see reliability success with every product they design, test, and manufacture. Divided into three parts, Reliability Engineering, Second Edition handily describes the theories and their practical uses while presenting readers with real-world examples and problems to solve. Part I focuses on system reliability estimation for time independent and failure dependent models, helping engineers create a reliable design. Part II aids the reader in assembling necessary components and configuring them to achieve desired reliability objectives, conducting reliability tests on components, and using field data from similar components. Part III follows what happens once a product is produced and sold, how the manufacturer must ensure its reliability objectives by providing preventive and scheduled maintenance and warranty policies. 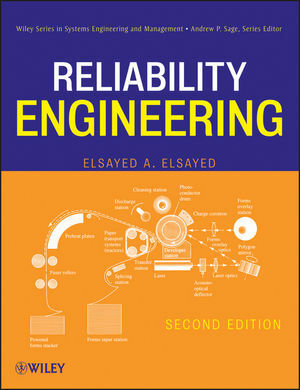 A comprehensive reference for practitioners and professionals in quality and reliability engineering, Reliability Engineering can also be used for senior undergraduate or graduate courses in industrial and systems, mechanical, and electrical engineering programs. Elsayed A. Elsayed, PhD, is a professor in the Department of Industrial and Systems Engineering, Rutgers University, and the Director of the NSF/Industry/University Co-operative Research Center for Quality and Reliability Engineering. He is the recipient of the Institute of Industrial Engineers (IIE) Fellow Award, an ASME Fellow, the Senior Fulbright Award, and the 2011 Thomas Alva Edison Patent Award. He is a coauthor of Quality Engineering in Production Systems and the author of Reliability Engineering, which received the 1990 and 1997 IIE/Joint Publishers Book-of-the-Year Award respectively.